Profit Squad was founded in August of 2015 by Ben Perchard and Joe Hawes and is owned by ABC Betting Ltd which also owns popular matched betting site MatchedBets.com. Prior to the development of Profit Squad, the duo were keen matched bettors and took it upon themselves to create a matched betting service that improved on current models out there at the time. Their aim was to develop a matched betting service which improved on customer support, training and additional matched betting tools. Since going live in December 2015, they have established themselves as a known name in the matched betting world. In March of 2018, ProfitSquad joined forces with MatchedBets.com and although the sites continue to operate as two separate matched betting services, they are now owned by one company, ABC Betting Ltd.
Today I’ll be signing up to their service and testing the site out for the purpose of this review. Click here to sign up to Profit Squad for ONLY £1 ! Unlike the majority of other matched betting sites, Profit Squad do not offer a free trial. Instead, they offer full access to their services for a small £1 fee for 14 days. After the 14 days a monthly subscription costs £18. There is also the option to manually upgrade to an annual subscription for £149 per year or if you dig a little deeper, you’ll find the option to subscribe quarterly for £44.99. This option is available once you have signed up for the 14 day trial. Some matched betting sites offer a free trial which may at first seem more appealing than paying £1. However, any free trial which you sign up for will have its limitations and you will not get access to all features of the site and service. For example, many matched betting sites give you access to 3 bookmaker offers which should make you around £40-£50 when signing up to their free trial. However, there are hundreds of these offers available when you become a paying member and you can get access to all of them for £1 with ProfitSquad instead of paying £15+ for a monthly subscription with other sites. You should be able to work your way through a lot more than 3 offers during the 14 day period which makes paying £1 for full access a much better deal. To provide a full review of Profit Squad, I signed up for the £1 / 14 day offer. After a quick click on the homepage button, payment was made via PayPal and I had instant access to the site. PayPal is currently the only way to pay for your membership with Profit Squad, although you do not need a registered PayPal account to pay via this method. The ProfitSquad members area recently had a revamp since their partnership with MatchedBets.com and now includes improvements to their dashboard, matched betting calendar and offer guides as well as a number of new features and tools. The first page I was directed to after payment was complete was the dashboard displays various links to account details, your matched betting stats and some helpful lnks for you to get started. In the navigation bar at the top of the dashboard is a ‘Getting Started’ page. This is a helpful page for new members which shows you how to get started with matched betting. The guide instructs new members to start with the new customer offers before moving onto the reload/existing customer offers and then finally onto casino and bingo offers should you wish. Many matched bettors do not bother with casino or bingo offers as many of them carry some form of risk. However, they can be extremely profitable in the long term and many Profit Squad members are very experienced in this field and there is a wealth of information on the Profit Squad forum and Discord channel covering this area. The offer guides on Profit Squad are excellent and some of the best we have come across. Each offer guide is broken down into sections for creating an account, placing your qualifying bet and finally, placing your free bet to make a profit. The guides are extremely well-written and beginners should have no problem following them even if they have no experience with betting. 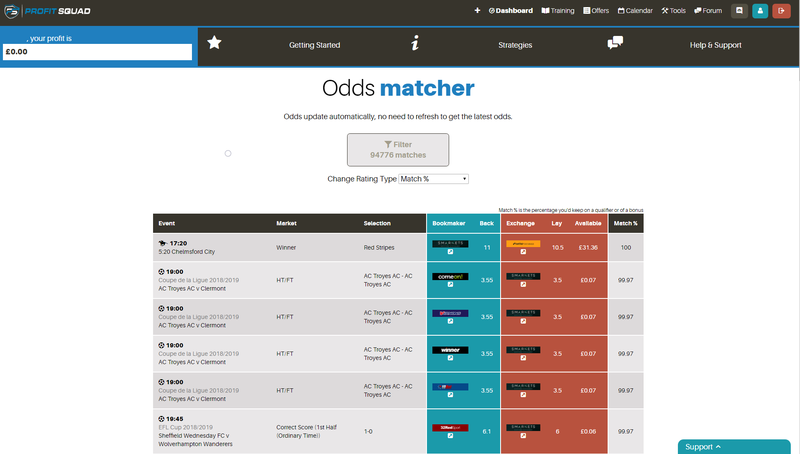 One excellent feature of the offer guides, which also features on MatchedBets.com, is the integrated odds matcher. 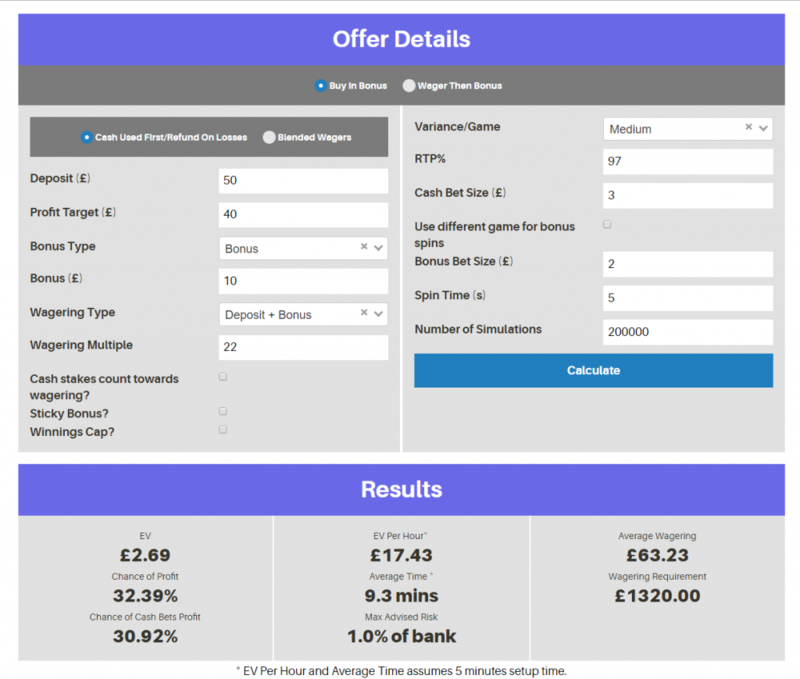 You’ll find the odds matcher integrated into each offer guide and preconfigured to the terms of that specific offer. For example, if you are viewing the William Hill new customer offer, the odds matcher in the guide will only display matches for William Hill which are eligible to qualify for the offer. If the minimum odds are 2.0 for the qualifying bet and the bet must be on football, the results in the odds matcher will only show matches based on that criteria. You could open up the odds matcher and manually filter it with these criteria but this saves a lot of time and effort. There are various categories for offers such as New Customer Offers, Sports, Casino, Advanced Casino (Available to annual members), existing customer offers, Accumulator Offers, Free Bet Clubs, Horse Racing Offer and Daily Offers. Currently, there are just over 60 New Customer Offers which can be turned into hundreds of punds of profit. The calendar is where Profit Squad list their daily reload offers for existing customers. 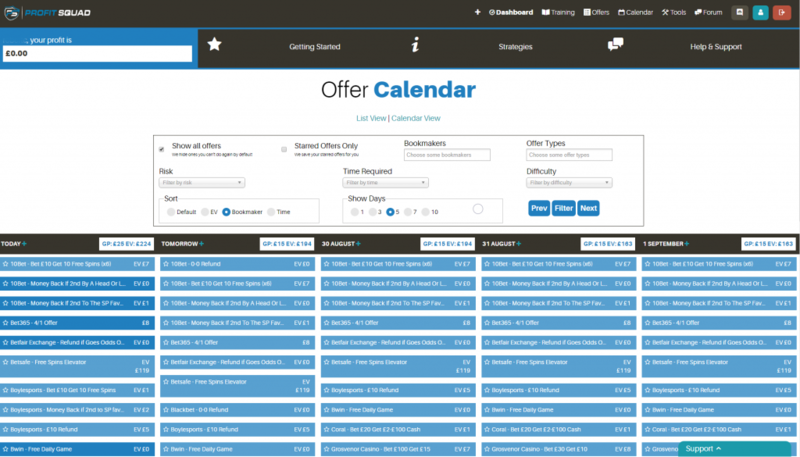 Having the offers listed as a calendar helps users work their way through the offers for the day and keeps things organised. At the top of the list of offers for each day Profit Squad list the total +EV and guaranteed profit should you complete all of the offers. Again, this is a nice touch as it gives users a clear understanding of how much they can profit each day. Clicking on an offer takes you to the instructions on how to complete it. 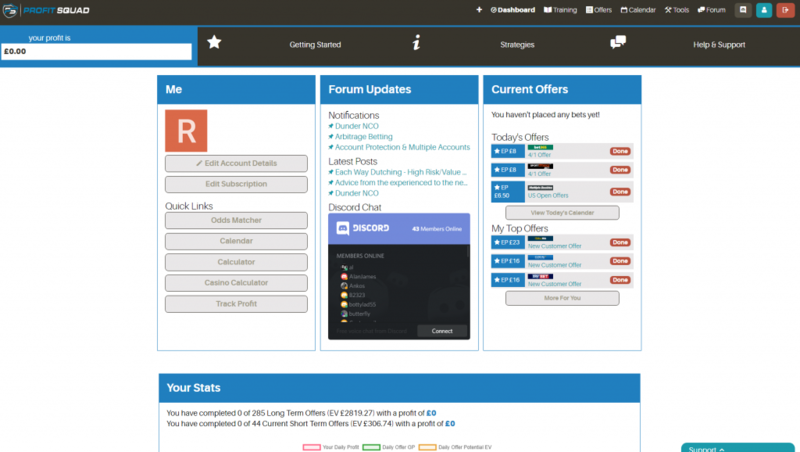 Users also have the option to discuss the offer on the forum. You’ll be using the oddsmatcher for the majority of your matched betting offers to find good matches and so it is important that you use one that makes the process as simple as possible and with good results. The Profit Squad oddsmatcher has everything you need to find a good match quickly. Events are automatically listed by rank, which is a score given by how good a match the bet is. Users can filter the events by bookmaker, exchange, min/max odds as well as the time of event, the market and if they wish to include ‘Arbs’ in the results. Arbs are matches which will provide a profit by simply backing on the bookmaker and laying on the exchange without the need for any bonus offer or free bet. Arbs are not usually recommended when matched betting as they are considered a ‘red flag’ signal to the bookies that you may be matched betting. Clicking on the icons opens a new window and takes you to the event page on the associated betting exchange or bookmaker. This is a good feature which saves time searching for the event manually. When clicking on an event, the calculator is opened in a new window whichcontains the pre-filled details of the event such as the back odds and lay odds. From here, users simply have to enter their stake along with the bet type and the calculator will display the required lay stake for maximum profit. Since the merger with MatchedBets.com, the Profit Squad odds matcher has been improved and now auto-updated. This means that when the odds change on the bookmaker or betting exchange, they’ll update automaticaly in the odds matcher along with the rating. This is a very useful feature, especially when trying to find a match on an event which is close to starting and the odds are fluctuating quickly. It saves users a lot of time and a feature we’d like to see on more matched betting sites. 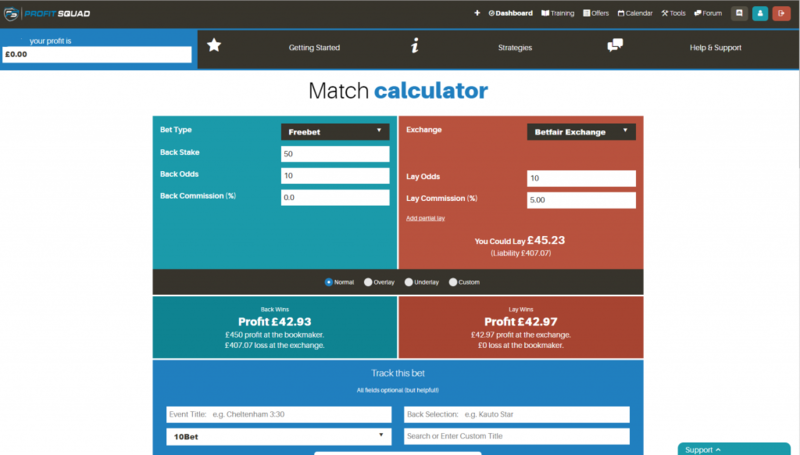 There are currently 49 bookmakers included in the odds matcher, giving users excellent options for finding matches for various offers and events. The Profit Squad calculator contains a lot of features and instead of having separate calculators for different offer types, users can simply select the bet type from the drop-down menu and the calculator will do the rest. The calculator automatically works out lay stakes for qualifying bets, Free bets, Bonuses, Bonus on Win, Bonus on Loss, Free bet on win, Free bet on loss, Free bet with free bet on win and Enhanced odds as free bets. These options cover a number of offer types and users just have to enter the back & lay odds, stake and exchange commission to be able to view the ideal lay stakes for their bet. There is also the option to choose to overlay, underlay or custom lay which is somewhere in between. Profit Squad focus a lot on casino offer and advanced casino strategy. Casino offers aren’t for everyone but many members have proved they can be extremely profitable in the long term. An essential factor in deciding whether or not to do a casino offer is if the offer is +EV or not. Thankfully, Profit Squad provide members with an advanced casino calculator which helps calculate the EV of an offer based on a number of factors such as bonus type, wagering requirements and a number of other terms which you may find in casino offers. The calculator is one of the best we have seen and will no-doubt help beginner and experienced casino players. Profit Squad provides a tool for users to track profits and completed offers. When an offer is completed you can click the button to mark it as ‘complete’. You can also track each bet you make by clicking on the ‘Track Bet’ button from within the calculator. The results are then shown in graph form for each month which is a nice way to monitor your matched betting process. Users can also view their total profit in the main navigation bar. Profit tracking is something all matched betting sites should have as the days of keeping spreadsheets to track profits is, or should be, long gone. Profit Squad members can view any bet they have tracked at any point and mark it as won or lost which will update their total profit. I also like the addition of the ‘potential profits’ in the graph which shows how much you could make if you completed all of the offers listed in the daily calendar. This feature will give users proof that a consistent profit can be made from matched betting every month even when all sign up offers have been completed. The Horse Racing Matcher is a great tool for quickly finding close matches for some of the most popular horse racing offers. Offers such as Bet365’s 4/1 offer, William Hill’s 2 Clear and multiple Money Back is 2nd offers can all be very profitable. The Horse Racing Matcher is preconfigured to display matches only for these offers making finding matches and completing the offers quick and easy. There are profitable dutching opportunities every day but finding them manually would be extremely time-consuming. 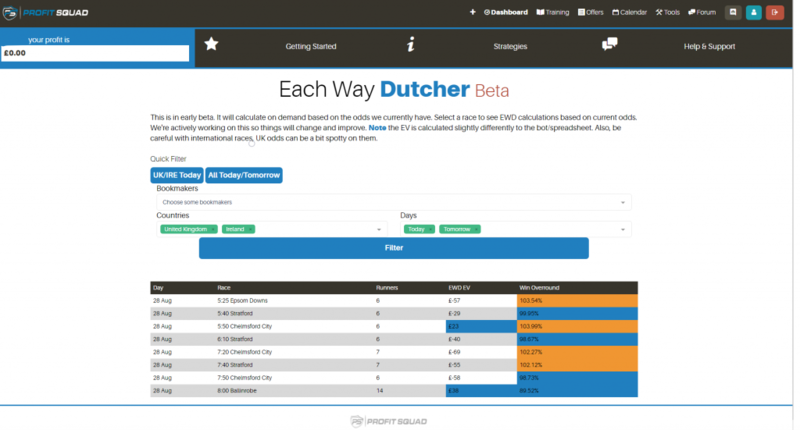 Thankfully, Profit Squad have developed an each way dutching tool which helps solve that problem. 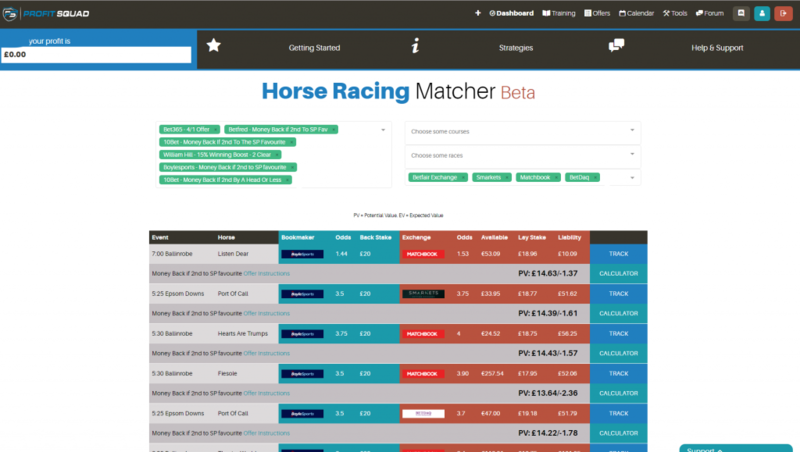 Although still in beta, the dutching tool displays dutching opportunities where users can place bets at various bookmakers on horse races and by covering the entire field, generate a profit. It’s a great tool which members seem to love. One thing Profit Squad seem to do well is look for ways to generate additional profits outside of standard matched betting. They have also developed an advanced Each Way Dutching strategy which is unique to Profit Squad and available to annual members. Profit Squad currently offer support to their members via email ([email protected]ofitsquad.co.uk), on-site forum and via their Discord channel. I sent an email to their support team and it was replied to after 20 minutes with a polite and informative reply from Joe, so no complaints there. The forum is laid out simply but effectively and posts are generally responded to very quickly. Post counts seem relatively frequent with members sharing offers that aren’t posted on the site, offering support and discussing current offers. For those looking to make a little extra on top of their matched betting profits, there is the option of joining the Profit Squad affiliate program. Their affiliate program works by giving you commission for referring customers to Profit Squad. For each premium customer you refer you will receive 50% of their subscription fee. Comparing this to other matched betting affiliate programs, 50% is standard and good value. Profit Squad state that most customers opt for the £1 subscription for 14 days and that 50% of these renew. They also claim that 30% of their customers are on annual plans which would earn affiliates a lot more commission for each referred annual member. From an affiliates point of view, Profit Squad converts well and offer a great service which helps with member retention. You can sign up to the Profit Squad Affiliate Program by clicking here. Profit Squad is an excellent matched betting site which offers a lot more than just the usual matched betting offers. There is a helpful and very knowledgable community of members who are constantly looking for additional ways to make money through betting sites. They offer a range of features and tools and offer very fair subscription fees for their 14 day, monthly, quarterly and annual packages. Their forum is great for users to ask questions and feel part of the Profit Squad community and we have no complaints about their email support. The Discord channel is especially useful for new and more experienced members and there seems to be a good number of members online at all times.